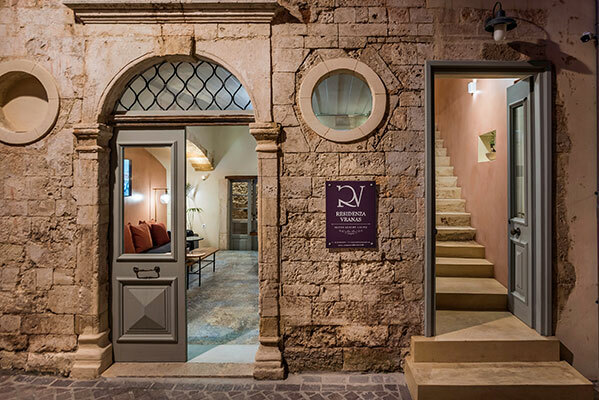 Overlooking the Old Venetian Harbor and the emblematic lighthouse, Residenza Vranas Boutique Hotel is the place to be in Chania. One of the finest, most privileged spots on the island of Crete with spectacular views that take your breath away and compose the idyllic backdrop for an unforgettable stay. Indulge in unpretentious luxury, experiencing the true meaning of impeccable services and refined, elegant accommodation. It consists of 4 stylish and luxurious suites all having spectacular views to the Egyptian Lighthouse and the Old Venetian Harbour of Chania. All suites are furnished with specially designed furniture and decorated with unique articles. Residenza Vranas is located exactly in the center of the Old Venetian Harbor of Chania! This hotel exceeded all our expectations beginning with prompt responses to our request for pickup from ferry terminal in Heraklion to packing breakfast sandwiches for our early morning departure. Not to mention the picture perfect location, exquisitely decorated rooms and personal attention from every member of the staff, including the owner George. It was hard to pull ourselves away from the hotel and go sightseeing. This is what a boutique hotel experience should be. Room Tip: Boutique hotel with only four rooms. Each one has a view of the harbor. An unbelievable hotel with great staff who can’t do enough for you. Would recommend this to everyone. A beautiful place. Frühstückservice direkt im Zimmer mit wundervollem Blick auf den Hafen von Chania. Dem geschäftigen Treiben der Restaurantbetreiber an der Hafenpromenade am Morgen zu zusehen, während wir entspannt bei Kaffee und leckeren griechischen Frühstück waren, haben wir sehr genossen. Abends konnten wir in der direkten Gegend (Altstadt 1 min ) sehr schön und gemütlich, Essen gehen, in einer Bar Cocktails trinken oder in den kleinen Gassen nach hübschen Souvenirs Ausschau halten. Das Zimmer, 2xDusche, 2x WC waren sauber und durch den Zimmerservice täglich geflegt, das Bett war sehr bequem. Der Kaffee (Nespresso) und eine Weinflasche im Kühlschrank standen uns zur Verfügung. Alles in allem eine sehr schöne Unterkunft mit netter Bewirtung, in sehr schöner Lage. Exceptional Apartment Pure luxury Exceptional service. The 2-bedroom apartment and penthouse we stayed in are beautifully designed and tastefully furnished. Very spacious with really comfortable beds. It’s right on the old venetian harbour with stunning unblocked view. Location is just perfect. Restaurants, cafes, shops just a short walk away. George, Katerina and staff are so helpful. A superb experience. Wonderful! Our favorite stay while in Greece!! Everything was wonderful! Our room was magnificent with an amazing view. Breakfast was delivered each morning. It was plentiful and delicious. Staff were attentive and very welcoming. We stayed in the plunge pool suite and we did not want to leave, in fact, we tried to extend our stay, but the room was booked. All other hotels in our future will need to live up to this gorgeous room with a fantastic view of the Old Harbor and lighthouse. Your suites are literally right in the center of it all. The plunge pool was an incredible feature and so much fun. The Moscato and delicious pastries in the fridge were a delightful and delicious surprise. Breakfast in our room was the perfect touch and the kind gesture to prepare us a breakfast to go as we had to leave very early, was above and beyond! Thank you again and we will miss the room, the view and the hospitality! A stay that exceeded our expectations in beautiful accommodation with delightful hosts. The room was even more beautiful than the photos and everything in it was spotlessly clean. With a view like this it was hard to pull ourselves away and actually go out. The property is right in the centre of Chania old town with a view out over the Venetian harbour where you could sit and look out at the sea and watch the world going by. Lots of shops and restaurants on the doorstep. Ένα από τα καλύτερα Boutique Hotel που έχουμε επισκεφτεί!! Συνδιάζει άνεση, πολυτέλεια, καθαριότητα, ηρεμία και απεριόριστη θέα!! Η διακόσμηση και ο συνδυασμός του μοντέρνου, μινιμαλ και bohemian κάνει τον χώρο πιο υπέροχο και δεν θελεις να φύγεις από κει. Το πρωινό εκτός ότι ήταν πλούσιο,το πιο σημαντικό για μένα ήταν ότι περιέχει φρέσκα τοπικά υλικά. Τα παιδιά ευγενέστατα και πρόθυμα να μας εξυπηρετήσουν! Το συνιστώ ανεπιφύλακτα και σίγουρα θα ξανά πάω σύντομα. A beautiful old renovated building with fantastic views and friendly staff. The best location in Chania old town with the most wonderful unforgetable views. Very helpful friendly staff. Very comfy beds. Great to have breakfast brought to your room. Couldn’t choose a better place to stay in Crete. The location is right by the water, at the old port in Chania. The window view is stunning! The hotel was just remodeled, super clean. There’s two bathrooms (you don’t see that often). The beds are super comfortable. Breakfast is delicious and fresh, served in the room. The staff makes you feel like a real guest, not only costumers. They gave us all kinds of tips, like restaurants, beaches to visit, booked us a car to rent. Everything we needed was provided right away. Not only recommend, but we definitely plan to come back. Маленький рай в центре Ханьи. It was a perfect experience and worth much more than we spent. The most satisfying stay ever!!! Everything is perfect, the location, the view, the room, the cleanness, and the warmest hostess! We spent 2 whole days in our room and didn’t even want to go out. The bed is so comfy and the breakfast is delicious and rich. The harbor view from our veranda is breathtaking. Definitely we will come and stay here again! Katerina, thank you for everything, we’ll see you soon next time! In our next trip to Chania, it would be our first choice.We also want to try the room with the pool! The view was astonishing, the room’s decoration was beautiful. You felt like staying indoors rather than going out really.. The room was too comfortable, the breakfast brought by Katerina in the room every day was something special! Congratulations ! We (two adults, four kids) had a fabulous 8-night stay in the top floor apartment. We arrived very late, around midnight, and were immediately wowed by the incredible view from the terrace, even at night. The apartment itself is lovely, tastefully decorated, the beds and pillows are very comfortable and there’s a massive Jacuzzi in the second bedroom. Everything stated in the previous reviews is true: the location is ideal, building is lovingly and personally restored, staff is fantastic. It’s a family-run place and they’re all siblings or cousins. I cannot rate this place highly enough. From the excellent communication before we arrived to the friendly attentive reception we received to the outstanding service throughout our stay. The room was stunning with high class fixtures, amazingly comfortable bed and bedding and innovative lighting. This is the first time I have ever written a review about any hotel- and I have stayed at more than a few in my lifetime. I loved everything about the hotel. The building itself is about 500 years old. The interior is very updated and yet it managed to showcase hints of what it might have been. Our room was beautiful! It was huge and we had the best view of the sea. The bathrooms were updated. I loved the furniture- simple classy and warm. What i loved the most about the hotel is the staff. From the moment we stepped in we were greeted with warmth and genuine hospitality. Our breakfast was delivered to our room every day. The food was fresh, tasty and had the flavors of Chania. I will always be greatful for a wonderful experience. Definitely worth it!!! Uns hat einfach alles sehr, sehr gut gefallen! Super liebe Gastgeber und ein wunderschönes Apartment mit herrlicher Dachterrasse. Wir würden definitiv wieder kommen! This place is amazing, we stayed in the penthouse which had amazing views, the most comfortable bed and the incredible jacuzzi tub. The room is super spacious and had everything we could want. It’s right on the water in the middle of the old town and walkable to everything. The staff couldn’t have been nicer and made some great reccomendations! Amazing view and impeccable customer service. This hotel had an amazing view, and impeccable customer service. The design and furniture were gorgeous. Beds comfortable, and location couldn’t be better. Little extra attentions like breakfast and family friendly service made this hotel one of the best we’ve ever stayed in. Einfach grandios, purer Luxus, besser geht es einfach nicht ! Das Hotel hatte die perfekte Lage inmitten der Altstadt. Das Personal war mehr als freundlich und hilfsbereit. Das Frühstück war liebevoll zubereitet und die Aussicht war atemberaubend schön. Wir sind schon viel gereist aber das war bisher eins der schönsten Hotels mit dem besten Preis-Leistungs-Verhältnis! Wir können es nur weiterempfehlen. Wir freuen uns schon auf unseren nächsten Aufenthalt dort. The Residenza Vranas offers extravagant rooms and excellent service. One of the most fabulous hotel rooms I have ever stayed in. A plunge pool at the foot of the bed and an Italianate balcony overlooking the picturesque old harbor of Chania. I felt like I was the Venetian Doge visiting my Cretan colony. This hotel was truly breathtaking!!!! The view from our room was amazing! Huge balcony and there are only 4 rooms in this Venetian style home. We had the penthouse and loved it!!! Great staff, perfect location, amazing room, memorable stay! I stayed in the penthouse. The staff is very friendly and even made sure to be there late at night for my arrival. The penthouse is a GEM located in the center of the old port with a perfect central view of the lighthouse. The penthouse is super spacious, modern, clean, and can easily accommodate up to 4-5 people. It’s one of my favorite rooms I’ve ever stayed at due to it’s uniqueness and location (and huge terrace). The showers are great in the rooms, but I didn’t get to try out the Jacuzzi. Great restaurants are at your fingertips just stepping out from the hotel door, I ate seafood which was super fresh almost every night. The beach is a 20 minute walk away and is great! I should have went more often. In the US this perfectly located, deluxe property would cost over a thousand a nite. Every detail was thought out in this architecturally significant, and well designed place. Beautiful, comfortable furnishings, bed and furniture. Huge plunge pool in the room no less, set at the perfect temperature with spa jets set in the perfect places. Over the top romantic, yet perfect apartment style room with compforable balcony overlooking the pretty Venetian port. I truly felt like a queen. Nous revenons d’une semaine passée dans cet établissement : parfait ! personnel très accueillant, chambre très grande, très bien décorée – je resigne pour l’année prochaine. le seul petit hic c’est de trouver à se garer, pas évident dans ce petit port magnifique qu’est La Chanée. As soon as we walked into our room, we said that we were never leaving and wanted to live here. The building and the rooms are so beautiful and detailed. It’s clear that the family who renovated loved this project and put so much care into it. I am not a person who always cares very much about the interior of hotels, but this place is something very special. Every detail of the room – from the wood floors, to the window views of the port, the carefully chosen pieces – is beautiful. The rooms are also very large making the view even more impressive. Exquisites Boutique Hotel. Hervorragende Lage und sehr hilfsbereite und zuvorkommende, Betreuung durch George und Katharina. Wir haben die atemberaubende Aussicht auf den Hafen von unserem Balkon jeden Tag genossen. Das Zimmer hat unsere Erwartungen übertroffen. Es war sehr gross und äusserst geschmackvoll eingerichtet. Ok, it may just be the best place in all of Greece! Wow is all I can say. We stayed in the penthouse and we couldn’t believe our luck as we walked in and toured our suite. It was huge, modern, perfect, beautiful…and that terrace is ridiculous!! The renovations were very well thought out and done with great taste and luxury. I can’t say enough about this place and the family that runs it is the kindest and most helpful people we have met. We didn’t want to leave and are already planning our next stay. Worth every penny and more. The only thing you must know is there are a lot of steps so if you have mobility issues, then this may not work, otherwise, really, there is no better place in Crete as we toured quite a few and stayed in several others in our 2 week stay. The magic and beauty of Vranas Hotel. WOW!!!!!! Just WOW!!!!! This Penrthouse suite was just amazing, with a huge terrace right in front of the Venetian harbor. with a full kitchen, lots of room, and a large jacuzzi in the master suite. George the property manager whose family also owns this chic boutique hotel was extremely helpful and I can now say I have a friend in Chania. We would recommend this property to anyone wanting to experience the true essence of the magical ambience that Crete has to offer. I give them a 5 Star Rating!!!!!! My jaw hit the floor when we entered our suite – Vranas Residenza is seriously indulgent luxury. Where else can you stay and have a view out to the harbour, not just from your bed, but from your own private pool?! Huge, comfortable bed, great shower, incredibly spacious living area, the pool (of course!) and stunning balcony overlooking Chania harbour and lighthouse. Situated literally in the heart of where you want to be in Chania, and run by a caring family, our experience could literally not have been better. The location/view overlooking the harbor is incredible, the service was totally personal (they organized a surprise cake and balloons for our daughter’s birthday), and the accommodations were spacious and top notch design. The best crew we have ever met, nice breakfest and the best view of the city the hotel is beyond our expectation..its close to all the good part in the port and city , very clean hotel and modern, we sure will come back. Nothing compares to it. See pictures. Go for it if spending few extra euros is not bothering you. After stay in some other places in Crete at least this hotel stands for its advertising. Will stay again if in Crete again. We spent five days in old Chania town. We spent three night in the plunge pool suite and two in the penthouse. Both were very spacious and well equipped. Views are stunning from both rooms. George and family went out of their way to accommodate any request. They recommended and reserved all restaurants. One restaurant that I would definitely try is Pallas on the rooftop. The food and service was a real treat. All in all great value. Overlooking Chania Old Harbor the feeling is great !!! a unique experience in a residence designed to provide comfort luxury privacy access to all bars restaurants local attractions. we stayed in the suite with the pool inside – what a feeling to dive in the pool right from the bed – no description in words – Discreet and very helpful service – Vranas Residenza has elevated the standards of hospitality in Chania Town – A real gem to luxury residence !!! A beautifully designed, elegant, stylish hotel. Very, very clean and equipped with everything you could need and more. Perfect location on the harbour with amazing views. Breakfast is included in the price which can be served to you in your room at any time. No need to get yourself ready for breakfast at a certain time, meaning you never miss it!!! The breakfast team are very accommodating and so very friendly. Extraordinary, exceptional, super spacious and the view is top notch!! My husband, 8 years old son and I travel frequently. We arrived to Crete a day of our hotel reservation that we had made at a 5 stars hotel and booked paying about $200 per night. The place were we were supposed to stay was fully booked to take us a day earlier. The owner arranged for us to stay the first night at Vranas Rsidenza. What can I say! !One of the most beautiful, chic, clean and spacious hotels. When you travel in Europe you normally end up with a small room but that was not the case at all with this property. The suite we were offered was about 900 square feet or larger. The decor is beyond gorgeous, the cleanliness is 5 stars and the view is to die for. The next day we moved to the hotel that we originally booked and we really missed Vranas Residenza. At the other property the room is very nice but very tiny…. We stayed at Vranas Residenza 1 week in April at the suite before the last floor (a family of 4). The hotel had just opened its doors a couple of months ago, parts of it are still being finalised. Vranas Residenza is an old Venitian style building just recently renovated. I was simply blown away by the beauty of the place. Each suite is different to the other. The design, the colours, the furniture and the attention to detail is incredible. The view is directly overlooking on the harbour and just sitting looking out of the window is a delight – really stunning! Odalar inanılmaz büyük ve iyi döşenmiş. Odaların manzarası ise inanılmaz. Nice big rooms with beautiful views of the harbour. Very hospitable and friendly owner. Convenient location. Superb breakfast by the cafe next door (Yummy pastries!). The best room ever, great people taking care of us, great location and comfort! Fantastic view! We had the room with the plunge pool…what can I say. It was an enormous room with a heated plunge pool with a retractable cover. I’ve never been in a room quite like it in my life. The view over the harbour was fantastic and the glazed windows kept the room quiet even when it was busy outside. The decoration was exquisite as well. As for location, its right on the harbour so all bars and restaurants are a stone throw away. Η διακόσμηση φοβερή, απίστευτη θέα, πεντακάθαρο , ολοκαίνουριο ! A room with “A” view !!! If I was asked in one word to describe Vranas Residenza only one is the appropriate…..”Magnificent”!!!! 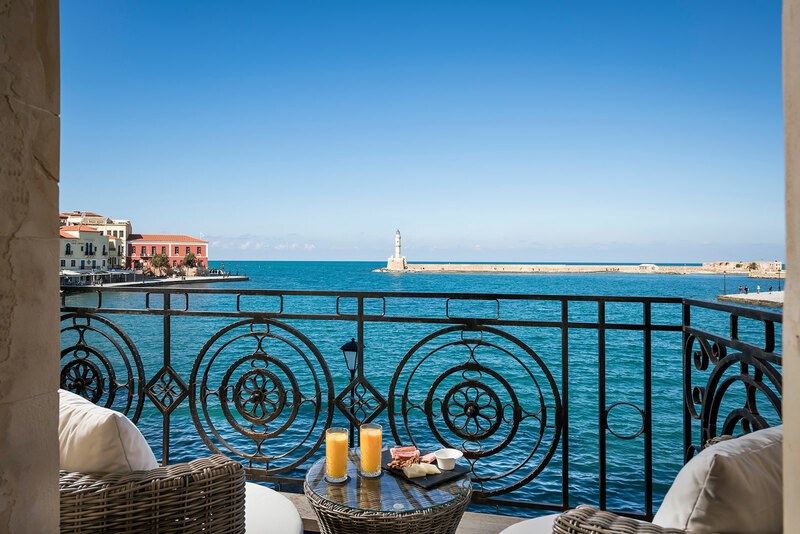 Located exactly in the middle of the old Venetian harbor of Chania , that only the sea is between your balcony and the old Lighthouse at a recently restored Venetian building . There are four suites . On the first floor is the one I had , with a heated indoors plunge pool . A suite in modern design and all comforts with a breathtaking view . The best place to relax after the long walks around the city . Location was ideal with a perfect view of the old harbor, the interior design is very special with a great balance of modern and traditional elements and the interaction with the owners was great. Very friendly and warm people. Awesome experience overall! Hotel muy especial en el puerto de Chania. The BEST possible location! Stunning views and in the heart of the harbor, just steps from everything in Old Town. New, luxurious, and spacious… nice open floor plan with lots of light and windows. A stylish and very romantic setting, we really have enjoyed our 2 week stay!!! A place of beauty, light and infinity. Sacred. I am guessing this wondrous dwelling was created by an architect; one who has been dreaming, planning, refining, indeed perfecting, his plans for year after year. And now that’s been realised. Fully. Ancient and modern. Tasteful but quirky. Natural materials, but a lot of tech. Huge in size and romance. The most amazing and inspiring view I have even seen from a town appartement; a rock light-house and the infinite blue, blue sea. The best hotel room we have ever stayed in! The location was perfect, right on the water, walking distance from everything you need. The balcony overlooking the gorgeous harbor is incredible. The owner and staff are very friendly. There is a coffee shop next door that will bring breakfast right to your door. There is an amazing restaurant, Tamam, that you MUST go to one minute away from hotel. The room with the plunge pool was so nice we didn’t want to leave! There is free WiFi and a big TV for when you want to lounge around and watch Netflix while sitting in the pool. My wife and I loved this place and loved Chania. Such a wonderful location. Old town Chania is a great place for a romantic honeymoon ? L’hôtel est très bien placé. La chambre est très grande avec une vue magnifique sur la mer. Le lit est très confortable et c’était très propre. Le propriétaire est très accueillant. I dare say the most amazing room we’ve ever stayed in. Huge space, clean, very nicely decorated with perfect view of the old harbour and the friendliest service It is the best choice you can make if you’re visiting Chania.